Martin Hubner is a Certified Strength and Conditioning Specialist (CSCS) specializing in adolescent and adult strength training. He is a 2009 graduate (BA) from the University of North Carolina Wilmington with a degree in Physical Education and Health, and a 2011 graduate (MS) from Appalachian State University with a degree in Exercise Science. His experience includes military, specifically Marines, Mixed Martial Arts (MMA) athletes, NCAA D1 soccer players and swimmers, and middle/high school football, basketball, baseball, and golf. Prior to his college education, Martin served active duty in the US Marine Corps and served as the Physical Training (PT) instructor for his platoon of approximately 60 Marines. 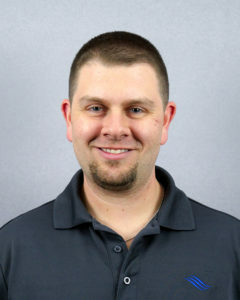 Currently he holds certifications from the National Strength & Conditioning Association (NSCA), the American College of Sports Medicine (Health Fitness Specialist), and USA Weightlifting (USAW L-1). He has developed the Youth Strength & Conditioning Program at the Wellness Center and serves as its primary coach where he teaches various strength training techniques and programs for 12-17 year olds.